The growth of the church at Heath continued under Rev. William E. Roberts who was appointed as pastor in 1918. Rev. 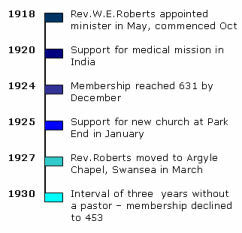 Roberts had previously been minister of Trinity Church in Aberdare. Interest in missionary outreach began in 1920 and efforts to open new churches in surrounding districts were also made. With a very large Sunday School and flourishing youth groups, the church reached a numerical peak in 1924. 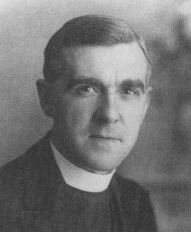 After 1925 economic decline and unemployment in Cardiff began to restrict the church’s activities and in 1927 Rev. Roberts moved Swansea. For the following three years the pastorate remained vacant and Rev. John Thomas agreed to return as an interim moderator.